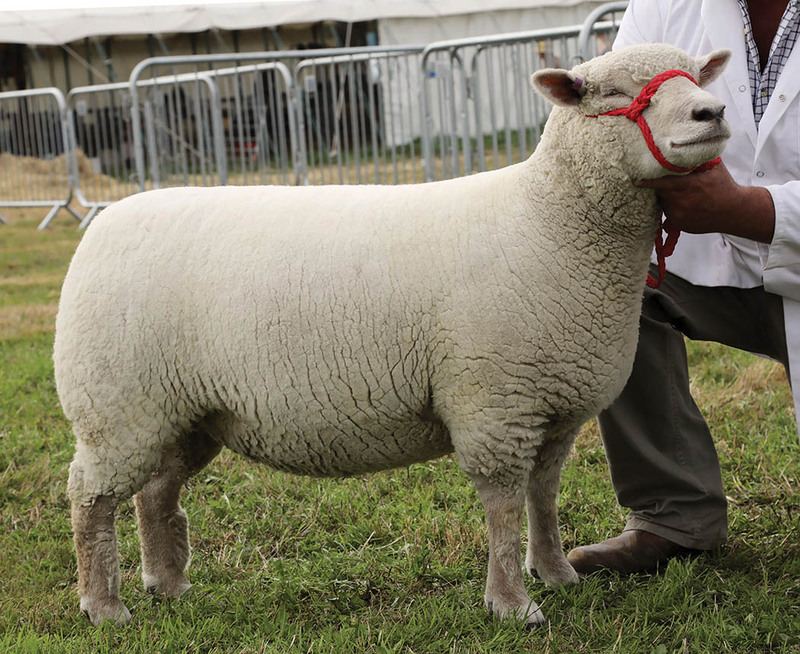 Taking the sheep inter-breed title for the first time at Dorset County show was Phil Tucker, New Forest, with his homebred Southdown shearling ewe. Inter-breed sheep champion from Phil Tucker, Lymington. The 2017-born Portmead daughter took the any other pure breed championship earlier in the day, adding to a strong haul of rosettes for the family this summer. Having taken the breed title at Gillingham and Shaftesbury and inter-breed championship at the New Forest and Hampshire County Show earlier in the season, this was its final outing of the year. In reserve was a 2016-born ewe from Ian and Fiona Andrews who run their Cattistock flock in Cattistock, Dorset. Having taken a handful of championships on the circuit this summer, this was their last outing of the season. No stranger to the pig championship rings this season, top honours here went to Julian Newth and daughter, Alice, Shepton Mallet, with their Pietrain, Prestcombe Paperasse 8. By Horbeck Merry, the September-2017 born gilt is out of the hombred Prestcombe Paperassse and has brought the show team multiple successes this year, taking breed championships at several of their local shows. Standing reserve was the Large Black, Sock Doreen 223, from Martin Snell, Yeovil. 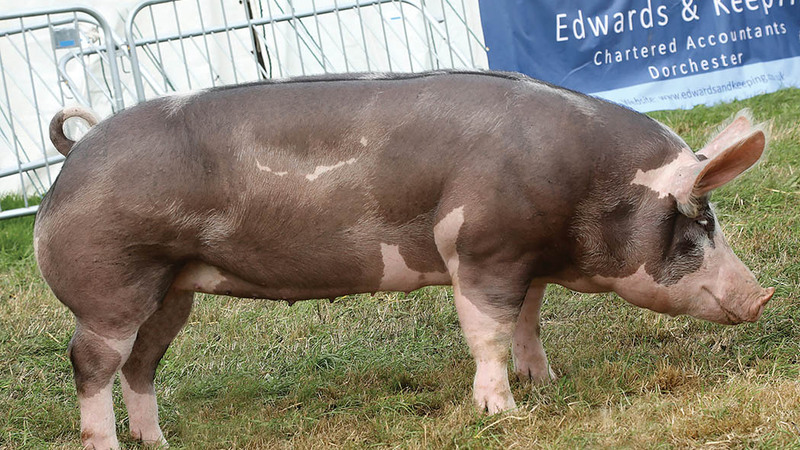 This was a first-time inter-breed placing for the Glenariff Attempt daughter, although it has taken several breed championship titles this season, most recently at Yeovil show, and also took the female Young Pig of the Year qualifier title at Devon show. Inter-breed pig champion, Prestcombe Paperasse 8, from J. and A. Newth, Shepton Mallet. Inter-breed beef champion, Wilodge Larimar, from Quaish Limousins, Cheddar. Held for the first time this year at Dorset was the BPA Young Pig of the Year competition qualifiers which saw a male and female champion go forward to the final. Tapped out by judge, Brian Mulkeen, Wigan, the Gloucester Old Spot, Chilthorne Sambo 300, from Beverley Wills, Chilthorne Domer, took the male title. A January-2018 born homebred boar by Chilthorne Sambo 157. He found his female champion in Tedfold Lena 5, the Duroc from Oliver Giles, Billingshurst. The February-2018 born gilt was bred by Hayley Loveless’ Dorset based Portbredy herd. In the beef section, it was Nick and Lisa Hill of Quaish Limousins, Cheddar, who took the top honours with the heifer Wilodge Larimar after a panel verdict from each of the beef breed judges. The Powerful Irish daughter out of the well-known Wilodge Diamante was bought privately by the pair earlier this year. It has taken titles at this year’s Bath and West and Gillingham and Shaftesbury shows as well as other locally. Standing reserve was the Aberdeen Angus, Cosmore Queenie, from Andy Edmunds, Buckland Newton. Making it the first inter-breed placing at Dorset for the family, this homebred heifer is by Oakchurch Evoc and has taken a handful of breed championships this summer, including Melplash most recently. 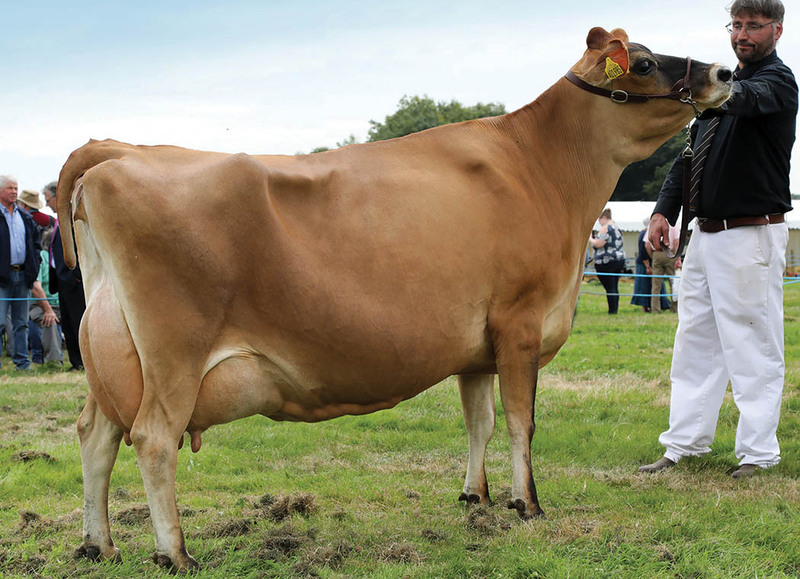 The dairy ring saw a Jersey take top honours for the second year running, this year going to Yeovil based Valerie Norman with her fourth calver, Perrins Minister Joyful 2. Giving 30kg having calved in February, this cow is a familiar to the show ring this summer having taken titles at Bath and West, Yeovil and most recently Melplash shows. In reserve was the Holstein Friesian, Moigne Attico Pansy, from the Frampton family, Owemoigne, making it their second time in the inter-breed line-up. The first-time calver was shown giving 45kg and resides with the families 600-head Holstein Friesian herd. Inter-breed dairy champion, Perrins Minister Joyful 2, from Valerie Norman, Yeovil. Inter-breed (A. Lyons, Axbridge and D. Bevan, Carmathern) Sup and lowland, P. Tucker (Southdown); res and res lowland, Cattistock Texels (Texel); sup. hill, heath and upland, D. and S. Rashley (Portland) res. hill, heath and upland, S. Thwaites (Shetland). Charollais (R. Harris, Holsworthy) Sup. and res., Brandywells Charollais. Dorset Down (T. Osborne, Radstock) Sup., D. Wilkins; res., L. Hext. Dorset Horn and Poll Dorset local (M. Care, Helston) Sup., E. Gascoigne and A. Smith; res., J. Angus. Dorset Horn and Poll Dorset (M. Care) Sup. and res. P. and H. Brooks. Greyface Dartmoor (J. Osborne) Sup., C. Nugent; res., D.J. Martin. Hampshire Down (A. Halcrow, Kettering) Sup., L. Heywood; res., G. Tucker. Jacob (S. Taylor, Newbury) Sup., L. Slee and T. Hooper; res., P. Gorringe. Lleyn (A. West, Kent) Sup. and res., P. and S. Eckett. Portland (H. Brewis, Newport Pagnell) Sup., D. and S. Rashley; res., M.C. Johnston. Primitive (H. Brewis, Newport Pagnell) Sup., H. Williams (North Ronaldsay); res., E. Gascoigne and A. Smith (Hebridean). Coloured Ryeland (J. Mills, Chulmleigh) Sup., S. Rowe; res., A. and G. Hopgood. Ryeland (J. Mills) Sup., S. Lake; res., H. Price. Shetland (D. Huxter, Crediton) Sup., S. Thwaites; res., Uping Down Shetlands. Suffolk (D. Lindon, Dorking) Sup., P. Brookes; res., G. Beckley. Texel (R. Jordan, Chagford) Sup., Cattistock Texels; res. ,G.E. Helyer. Valais Blacknose (R. Tucker, Tavistock) Sup., D. Hodge and J. Walters; res., C. Slee and T. Hooper. Any other pure breed (D.J. Churchill, Axminster) Sup., P. Tucker (Southdown) res., A. Tucker. Any other pure breed continental (D.J. Churchill) Sup., L. Gregory (Beltex) res., K. Thompson (Blue Texel). Any other rare or minority breed (M. Flatt, Crewkerne) Sup., J.A. Gamblin (Galway) res., J.A. Gamblin (Galway). Inter-breed (B. Mulkeen, Wigan) Sup., J. and A. Newth, Prestcombe Paperasse 8 (Pietrain); res., P. G. Snell and Sons, Sock Doreen 223 (Large Black). Modern breeds (M. Horsley, York) Sup., J. and A. Newth, Prestcombe Paperasse 8 (Pietrain); res., J. and A. Newth, Prestcombe Cordelia 17, Landrace. Any other traditional breed (M. Naylor, Framfield) Sup., O. Giles, Tedfold Dorothy 155 (Middle White); res., M. Paddock and S. Marsden, Eaves Yootha 25 (Middle White). Gloucester Old Spot (M. Naylor) Sup., M. Smith, Cosscoombe Primrose 11; res., M. Smith, Cosscoombe Primrose 17. Oxford Sandy and Black (M. Naylor) Sup., A. and M. Case, Longash Gert 14; res., A. and M. Case, Longash Jack 40. Berkshire (M. Naylor) Sup., I. Parkhouse, Fossehouse Excelsa 137; res., D. Yates, Maxcroft Suzanne 16/17. Large Black (M. Naylor) Sup., P. G. Snell and Sons, Sock Doreen 223; res., P.G. Snell and Sons, Sock Doreen 213. Tamworth (M. Naylor) Sup., A.J. Brown, Valstock Princess 894; res., A.J. Brown, Valstock Jacqueline 2095. Saddleback (M. Naylor) Sup., J. and A. Newth, Prestcombe Silverwings 60; res., M. Philp, Freestone Dinah 16. KuneKune (M. Naylor) Sup., Kinecroft Pigs, Oak View Jenny 7; res., Kinecroft Pigs, Kinecroft Jenny 19. Any other cross breed (M. Horsley, York) Sup., S. Groves, Watchingwell Hilda 118a. 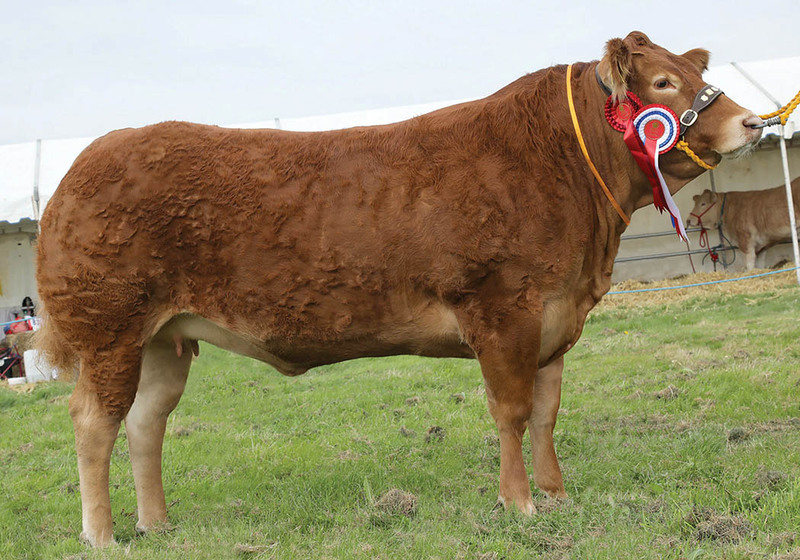 Inter-breed (Panel) Sup., Quaish Limousin, Wilodge Larimar (Limousin) res., A. Edmunds, Cosmore Queenie (Aberdeen Angus). Any pure-bred breed native (D. Barker, Taunton) Sup., A. Edmunds, Cosmore Queenie (Aberdeen Angus); res., S. Hollier, Long Ash Euseful (Speckle Park). British Blue (P. Walker, Hunnington) Sup., Newpole British Blues, Newpole Lomu; res., Newpole British Blues, Newpole Maverick. Any pure-bred breed continental (D. Knight, Bristol) Sup., Quaish Limousins, Wilodge Larimar; res., Quaish Limousins, Keenaught Moose. Devon (M. Allen, Huntington) Sup., Poad and Slee, Exmoor Flirt; res., M. Parsons, Warson Goliath. Dexter (B. Stamp, Exeter) Sup., M. Craggs, Burdon Moneypenny; res., C. Davis, Ols Wolford Street Pea. Lowline (M. Cormack, Dinmore) Sup., Wessex Lowlines, Alta Sadie; res., Wessex Lowlines, Wessex Gloria. South Devon (N. Edwards, Tavistock) Sup., J.C. and A.M Coward, Copella Bryony; res., R.J. Dimond, Shepton Rose 3. Rare and Minority Breeds (P. Stanley, Nr. Coalville) Sup., D. Phillips, Ethreridge Roany (Longhorn) res., J. and M. Bennett, Dallyashes Poching (British White). Inter-breed (T. Cox, Shaftesbury and D. Hawkins, Honiton) Sup., V. Norman, Perrins Minister Joyful 2 (Jersey); res., A.W. and F.M.M. Frampton and Son, Moigne Attico Pansy (Holstein Friesian). Any other breed (D. Hawkins) Sup., V. Norman, Perrins Minister Joyful 2 (Jersey); res., R. Norman, Trewey Legend Rosie 19 (Guernsey). Holstein and British Friesian (T. Cox) Sup., A.W. and F.M.M. Frampton and Son, Moigne Attico Pansy; res., T. Wonnacott and H. Hansford, Ciderhouse Brody Sally.